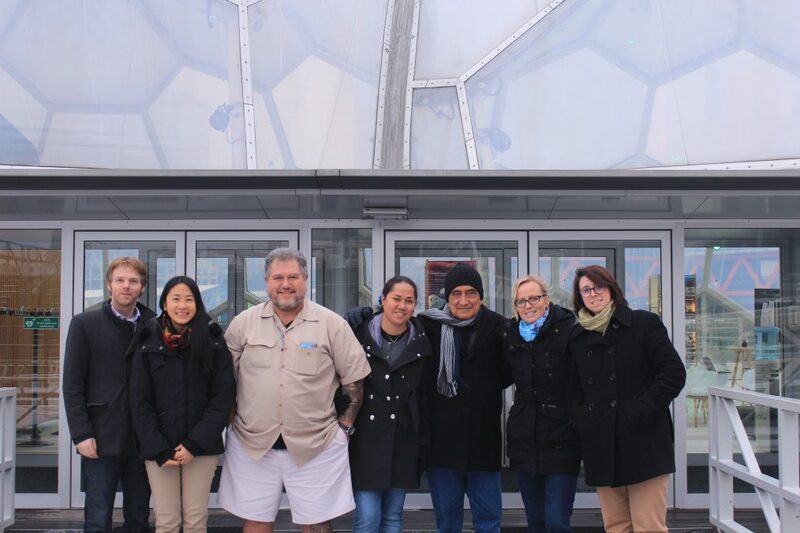 The Floating Pavilion, on a cold winter morning, was the backdrop to the first meeting between former president, Mr. Oscar Temaru, his daughter and former Minister of Environment & Sustainable Development Teua Temaru, son-in-law and Deputy Mayor of Faa’a Moetai Brotherson, and Blue21’s team consisting of co-founders Karina Czapiewska and Bart Roeffen, and researchers Barbara Dal Bo Zanon and Vicky Lin. Both parties were excited to meet each other in person to discuss the historic plans to pilot a floating neighborhood off the coast of Tahiti. The exact location of the floating development has yet to be determined, with several aspects needing to be taken into consideration when choosing the perfect site. Sea tides, wave build up in atolls and lagoons, as well as marine activity and ecology in the waters surrounding the island, must be investigated before deciding on where the floating structures should be developed. Over the years many large real-estate projects, such as luxury hotels, have been realized on Tahiti, not all however have turned out to have long-term potential with several of them being closed and abandoned. Mrs. Temaru voiced concerns that locals are becoming weary of “big, fancy, labour-intensive projects” that are short-lived. In her opinion the floating city project must have a long-term vision of at least 30-40 years in order to convince the Tahitian residents that this recent project will be of value to the local community for years to come. This should also be reflected in the design of the floating development. Helping locals envision how they can interact with the facilities on the floating islands should positively impact opinions in the local community. The floating Island project creates exciting possibilities for French Polynesia to stimulate economic growth and technological advances. As French Polynesia is highly dependent on imports, it will be important to investigate the feasibility of building with local materials and developing new concepts for food and energy production. This in turn will contribute to the sustainable nature of the project as well as generate knowledge that can be exported to neighboring island states to help solve shared sea level rise challenges. The conclusion of this first productive meeting is that there are numerous opportunities to be explored during the development of the floating islands that could bring new economic opportunities and help solve both local and regional challenges. The way the floating development is presented will be vital in receiving more than just the backing of the current government, but the backing of the local people. In the end, the most important stakeholders are the people of French Polynesia.